Talathi Previous Question Paper 2019 Pdf– The contenders of the Maharashtra Talathi Bharti exam are hereby notified that they can download the Talathi Question Papers 2019 from our site. Additionally, these Talathi Bharti Previous Question Papers have been enlisted according to the various districts participating in the recruitment. You can also view the Talathi Model Question Paper PDFs according to each of the years they appeared in. The various districts partaking in the Maharashtra Revenue Dept are Pune, Akola, Beed, Ahmednagar, Hingoli, Kolhapur, Nashik, Nanded, Yavatmal, Solapur and many more. These papers have been collected and compiled by our team here at GovtJobIndia.com for users benefit. We have borrowed them from the official website mahapariksha.gov.in. Candidates will be able to download the Talathi Qps pdfs directly onto their personal computer or laptop or mobile. And utilize it according to their preparation time. Furthermore, in case you have any difficulties saving the PDFs, you can comment below and our team will get back to you as soon as possible. 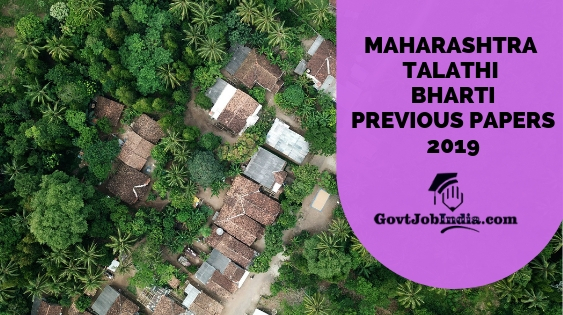 As you might know, the Talathi Bharti 2019 was an astounding chance for talented individuals across the state to secure a govt job in the revenue dept of Maharashtra. You should definitely not miss this opportunity just because you failed to prepare appropriately. That is exactly why we have made this article. So, now that you have gone through the summary of this article, let us move onto the detailed version. Candidates will find the papers attached here. You can download them at a mere click and utilise it whenever you please. Furthermore, we will be adding more papers to the lot all the time. Make sure that you are here for that. You can do so by pinning this tab to your browser. All you have to do is (CTRL+D) and you will be enabled to see this page whenever you want to. As we have mentioned previously, there are two sides to good preparation for the Talathi Bharti. One of them is practising the model question papers. But this will be possible only when you have gone through the syllabus and study material of the recruitment exam. This, given below, is the general scheme of the Talathi Bharti Exam Paper. Candidates can refer to this and start preparing for the recruitment exam. In case, you as an applicant have any doubts related to any of the sections mentioned, address them in the comments below and our team will be glad to assist you. How did you like this article about the Maharashtra Talathi Model Question Papers 2019? Did you think this article was sufficient? If yes, make sure to share this piece with all those who might be looking for it. Furthermore, we will be adding more and more papers to this lot as and when we find the question papers. So, make sure that you bookmark this page to your browser so that you don’t miss any of these. Moreover, you can also make sure that you fall behind on any updates about this Talathi Bharti by subscribing to our website @ GovtJobIndia.com. When you subscribe, you will be notified of the latest updates. We wish you all the best of luck for your Maharashtra Talathi Exam 2019.